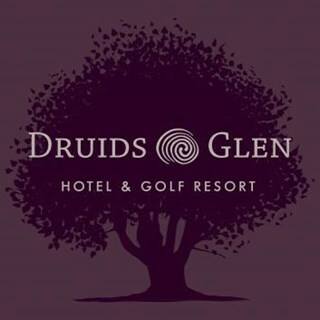 The five-star Druids Glen Hotel & Golf Resort is nestled in 360 acres of countryside between the Wicklow Mountains and the Irish Sea, yet only thirty minutes from Dublin. They offer several dining options for guests to choose from during their stay. 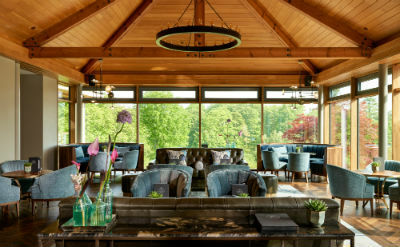 The newly refurbished Garden Rooms and Bar is the heart of the hotel, offering a calm, welcoming respite from the outside world, with stunning views overlooking the famous 13th hole on Druids Glen Golf Course. The Garden Rooms offer beautiful bespoke furniture, handmade in Ireland with a vibrant palette taking inspiration from the surrounding picturesque landscapes. The luxurious décor features dark green leathers, subtle blues with walnut and brass. The addition of a slight pop of colour and a range of textures including velvet and fabrics complements the magnificent setting. The impressive terrace completes the Garden Rooms and Bar and sets the scene for a relaxed experience in the ‘Garden of Ireland’. 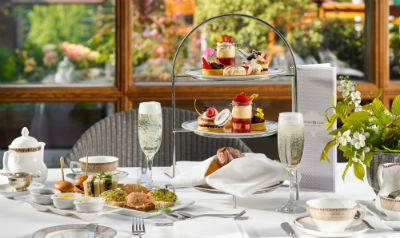 For an extra special treat try our splendid Afternoon Tea which is served daily in The Conservatory. Relax and enjoy a sumptuous selection of sandwiches, homemade scones, cakes and indulge in the ultimate in sweet treats. 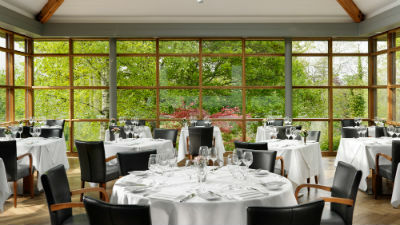 Served daily in The Conservatory from 1.30pm - 4.00pm. For an alternative dining experience, enjoy the period charm of Woodstock House with its fantastic setting at the 1st tee on Druids Glen. Complimentary appetisers were a lovely surprise and chocolate sweets also. Would definitely come back. Great service...a rare blend of finesse and friendliness. Food was of great quality and attention to details were evident. Lovely hotel, great restaurant, great staff. Food, service and armosphere were absolutely fantastic. I can't fault a single thing. Top marks to the restaurant, we will certainly return. Food was lovely. Not a huge amount of choice. Was valentines night so expected it to be romantic, this was somewhat ruined by 2 children over at the side watching iPads at a high volume throughout the meal. Amazing food. The starters and desserts are works of art. Main course chef needs working on. Choice limited on main courses and flavors confused. Service was very good. Atmosphere great although lighting so dark you needed your phone to read the menu. Fantastic food and venue! thanks so much! Also the staff were brilliant! From the moment we arrived to the moment we left the service was 2nd to none! The staff very professional without over doing it. Alot of hotels brag without backing it up but druids glen is a credit the staff and managment. Alot of small touches that made our stay one to remember. Will be back very soon. Amazing service made feel very special, food and hotel were out of this world, our server that night was a lovely person very attentive. A taste and artistic sensation. From the moment we arrived to when we left, we were delighted with the fabulous and attentive service, without feeling crowded. The attention to detail of every morsel that was lovingly produced by the extremely creative chefs was a complete thrill to the tastebuds. All of the servers and waiters execute their roles so professionally and are happy doing so. It was a treat for us to be completely spoiled and we will be booking a table for our next celebratory meal. Food and service   fantastic, highly recommend . Service was friendly and efficient. Food was beautifully presented and tasty. Overall was very satisfied. Have no complaints only high praise for both staff and food. Hi. I had the chef special starter. Three tiny prawns and two crab claws. It was lukewarm as was my husbands. Main course was fillet of beef. Gorgeous ! We had cheese plates after. Poor selection. No brie or blue. Just a couple of hard cheeses and some goats cheese. Hazel or hostess and Al our waiter very nice. Very friendly atmosphere .Excellent food and service.Our waiter Nishal was excellent. Thank you to everybody in Druids Glen for making our stay so memorable. Very disappointed on Saturdsy evening. We Had a 8.30 booking, our main course arrived at 10.15. Waitress blamed it On a big group in front of us. My steak arrived well done when I ordered a medium. Overall too many apologies for a 5 star hotel. The food was actually very nice but the overall evening was disappointing.